Sporting excellence delivers social mobility, and concurrent fame, like no orthodox profession can. Consequently, many cri­cket-obsessed teenagers from underprivileged backgro­u­nds in the sub-continent have dre­a­med of excelling at the game, making a name and, in the T20 context, earn a quick buck. Some made it to the top, while others fell by the wayside, for different reasons, after showing initial promise. In IPL, players like pacers Kamran Khan (Rajasthan Royals and Pune Warriors), Nathu Singh (Gujarat Lions and Mumbai Indians), and Thangarasu Natarajan (Kings XI Punjab and Sunrisers Hyderabad) have either tasted moderate success or have fizzled out. More youngsters wielding bat and ball are taking the IPL route to make a mark and to liberate themselves from the indignities and daily grind of lower middle-class existence. The three standout examples in this year’s IPL were the burly Jammu and Kashmir big-hitter Manzoor Ahmed Dar, who was part of the Kings XI Punjab, Kolkata Knight Riders’ stylish batsman Rinku Singh from Uttar Pradesh, and Hyderabad-based pacer Mohammed Siraj, who has surprised all with his sudden rise to stardom. The awesome strength in Manzoor Ahmed Dar’s large hands comes out of hard labour. Son of a labourer in Kashmir, Manzoor is used to jobs like working on paddy fields and lifting heavy goods from trucks. His arm strength gives him a vice-like grip on the bat handle; bludgeoning the ball is the natural outcome. Cricket has been Manzoor’s first love, but the demands of poverty would gnaw into his playing time. Being the eldest of eight siblings, 24-year-old Manzoor, who studied till class XI, is responsible for the well-being of the others, who are all students. But adversity didn’t deter Manzoor—the six-foot-one-inch tall man worked as a guard at a car showroom at night and played cricket during the day. That his village, Shigan Pora in Sumbal area, was just about 25 km from Srinagar helped in the discovery of his talent. The turning point came at the 2018 IPL auction, at which the Kings XI Punjab bought Manzoor at his base price of Rs 80 lakh. Though the money resolved some financial issues, Manzoor didn’t get an IPL game. The word-of-mouth reputation of his big-hitting ability will surely be confirmed in IPL 2019. Muzaffar Jan, a former cricketer, was one of the first to spot that distinctive steel of passion in him. “I’ve been following him for seven-eight years. 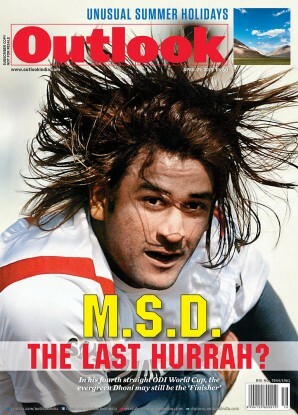 I first saw him hit big sixes when a friend took me to a match in Leh. I asked Man­zoor to play for United Cricket Club in Srinagar; he has been representing my club for three years,” says Muzaffar. Till recently, Manzoor used to do hard labour to support his family. His passion and big-hitting ability brought him into the KXIP camp. Manzoor was then picked for the J&K team for BCCI’s 20-over Syed Mushtaq Ali Trophy and 50-over Vijay Hazare Trophy in 2017 and 2018. His two landmark innings—which prompted his much bigger rivals to take selfies with him—came against a strong Punjab team studded with Yuvraj and Harbhajan. One was a 10-ball 26 in Dharamsala in 2016-17; the other a brutal 33-ball 38 n.o. in Delhi. Scouts of IPL franchises scour the Syed Mushtaq Ali Trophy to spot new talent. His cameos brought Manzoor in sudden, sharp focus. Kings XI Punjab grabbed him at the auction this January. KXIP director of cricket operations, Virender Sehwag, tells Outlook that Mit­hun Manhas, the assistant coach, had recommended Manzoor after watching him eff­ortlessly hammer sixes. Although Manzoor couldn’t break into the R. Ash­win-captained playing eleven, he is not bitter. “In Jammu and Kashmir, exposure was virtually zero. So, even if I didn’t get to play a game in this IPL, the experience I gained was invaluable. I have a passion for cricket, a junoon (craziness). And my target is to represent India within a year or two,” Manzoor tells Outlook. Also, the handsome amount Manzoor made would ease out things at home. His parents are happy too that their son is now doing something meaningful and earning a few bucks. Not just KXIP, but Rajasthan Royals was also interested in Manzoor, after news of his big-hitting ability spread fast. The Royals invited him for trials this year, but Manzoor admits it didn’t go off too well, as he became a bit ‘nervous’. Destiny then took him to Mohali, HQ of the Kings, where he picked the minds of some of the biggest names in cricket. The IPL is over, and it is cricket’s rare off-season season in India. After Eid, Manzoor will start training and practising again—in his quest to make it to Team India. In 2012, when he was all set to travel to Kanpur from his hometown Aligarh to appear in the under-16 selection trials for Uttar Pradesh, Rinku Khanchand Singh’s registration form disappeared mysteriously. According to rules, no player would be allowed to take the trials without submitting the registration form. “His registration form suddenly disappeared, perhaps because of someone’s petty jealousy,” recalls Masood-uz-Zafar Amini, Rinku’s coach for over eight years. A former cricketer came to the rescue of a distraught Rinku and prevailed upon the selectors to make an exception for the promising batsman. Rinku reached Kanpur, impressed the selectors with his untrammelled hitting, and was selected in the Uttar Pradesh team. Living up to his promise, the left-hander amassed 411 runs at an average of 68.50 in six matches, with one century and two half-centuries in the U-16 Vijay Merchant Trophy in 2012-13. His cricketing journey had truly begun. The next major turning point came this January when Kolkata Knight Riders bought the 20-year-old for Rs 80 lakh. In 2017, KXIP had bought him for Rs 10 lakh. Coach Mansoor Ahmed Khan was the first to spot Rinku’s talent about nine years ago. “During a break in play in a local match, when Rinku was batting on 80-odd, I told him that if he took cricket seriously it could change his family’s poor condition. He replied: “Bhaiyya, main koshish karunga (I will try),” recalls the former Aligarh Muslim University cricket captain. For over five years, Rinku has been a regular at Khan’s MK Aligarian Cricket Academy, practising before a bowling machine under bright LED lights—the only such facility in Aligarh. One of six siblings, Rinku has always faced hardship. His father delivers coo­king gas cylinders. The family lived in a one-room servant quarters with a tin roof. But the location of his home—close to the Devi Ahilyabai Holkar Sports Stadium in Aligarh—turned out to be providential. The cricket bug caught him and soon he got in touch with Amini, who used to coach at the stadium. Rinku went on to represent the UP under-19 team as well, before breaking into the senior state team. Then, in his Ranji debut season, he slammed three half-centuries in four matches in 2016-17, triggering interest of IPL franchises. Though the 2018 IPL wasn’t a good hunting ground for Rinku—he managed a mere 29 runs in four matches—it helped him financially. He has purchased a piece of land and the construction of a new house is underway. “It will be a two-storey house and my entire family will shift there once it’s complete,” Rinku tells Outlook. Mohammed Siraj is the son of an auto-­rickshaw driver in Hyderabad. Siraj chose fast bowling and has risen so fast in the last two years that former India pacer Ashish Nehra says that the 24-year-old pacer should be playing in all three formats for India. So far, Siraj has played only T20 Internationals. “He has bowled better than everybody had expected. It is not easy to bowl in the last three-four overs in IPL. Even experienced bowlers get hit for runs. As a bowler, Siraj is growing. His platform is set and it is now in his hands how he takes it forward,” Nehra tells Outlook. Interestingly, an injury to Nehra paved the way for Siraj to make his IPL debut for SunRisers Hyderabad last year. This year, after retiring from all cricket, Nehra became bowling coach of the Royal Challengers Bangalore and it was no coincidence that Siraj was bought by Virat Kohli’s team, for Rs.2.6 crore, up from his base price of Rs 1 crore. The swift ascent of Siraj (above, with parents) in recent years made the SRH acquire him last year. RCB snapped him up for Rs 2.6 crore in 2018. Siraj’s family is not a large one, but limited means of income always posed a problem. 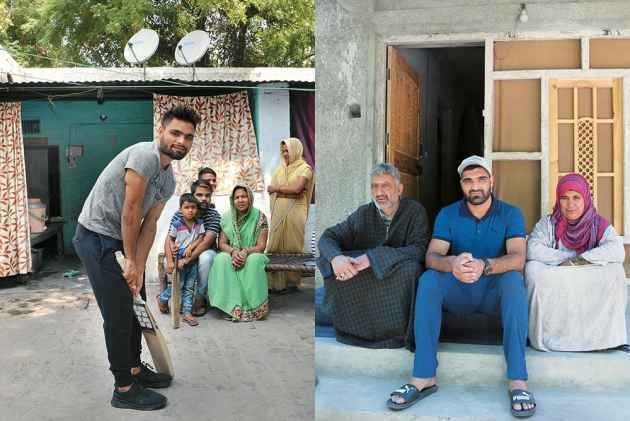 Paucity of money also meant that Siraj, who studied till class XII, couldn’t pursue his only passion—playing cricket—as the gear and kit come for a price. He broke through when a local club in Hyderabad conducted trials to unearth fast bowlers and Siraj impressed the org­anisers. Crucially, he had no experience of competitive cricket—he had learned his lessons at the Eidgah ground in Hyderabad. He had also missed the under-16 and under-19 tournaments of any standard. But when Siraj joined the fray—in the under-23 CK Nayudu Trophy in 2015-16—he made it memorable with his brilliant performances. Suddenly, everyone was talking of his raw talent and pace. He snared 24 wickets in seven matches, and was well on his way. The instant impact Siraj made is amply reflected in a remarkable statistic of his first season in various BCCI-organised tournaments in 2015-16—he had the unusual feat of making four debuts in four different tournaments in successive months, between October 2015 and January 2016. It was Siraj’s superb progress that made Royal Challengers Bangalore pounce on him this season. Nehra, who bowled in tandem with Siraj at SunRisers impressed upon RCB captain Virat Kohli and the owners the need to pick him at the auction. “Siraj is a natural talent. He has all the ingredients that a fast bowler should have. He has the pace, bowls a good yorker, a good slower one, and a slow-ball bouncer. He can be successful in all formats, including red-ball cricket, because he has the pace,” says Nehra. The pacer, who played 11 matches in IPL 2018, taking 11 wickets at an economy of 8.95, says IPL matches are nerve-racking at start, because of the pressure of the crowd in the packed stadiums. “This year I focused on my pace and variations, like knuckle balls, and slower and quicker bouncers,” says Siraj, who has recently acquired a Jeep Compass. Siraj’s elder brother Ismail quit his job as a software engineer and now acts as manager of his star brother. “I left my job bec­ause there was nothing bigger than Siraj’s success. All in our family dreamed of Siraj representing India and it has happened,” says Ismail. This year’s IPL has exploded to a finish, but the dreams of these young boys about making a name for themselves in the world of cricket continue to unspool, defying the mere end of a season.